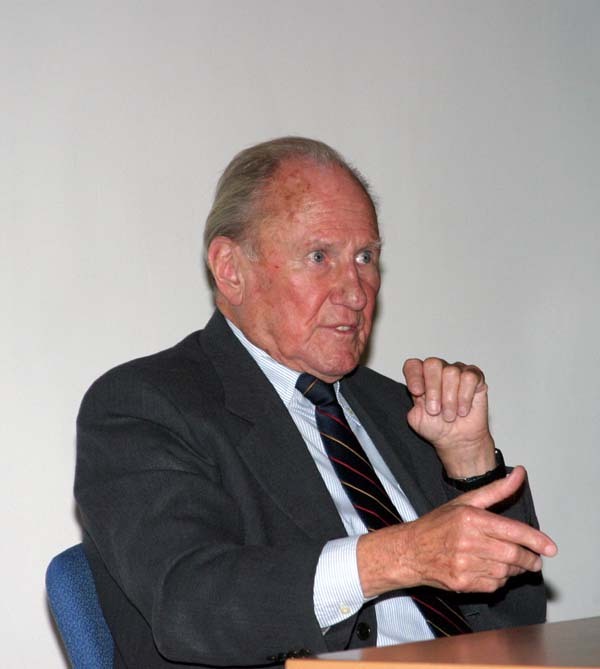 His story spans a childhood in a defeated country, two world wars, the calamity of the Nazi regime, the Cold War, the jet age, his distinguished service as a NATO military representative, his work with the US Air Force, and chief of the new German Air Force. In civilian life Rall has been one of the most sought-after military consultants and advisors by international agencies, ministries of defense, and multinational corporations. He told extensively about his career with JG52 from Battle Of France, BoB, to Greece, Crete, Romania, Russia and to end of hostilities in the west. The Finnish Virtual Pilots Association will, with time, present the whole lecture by mr. Rall, including downloadable video snippets. 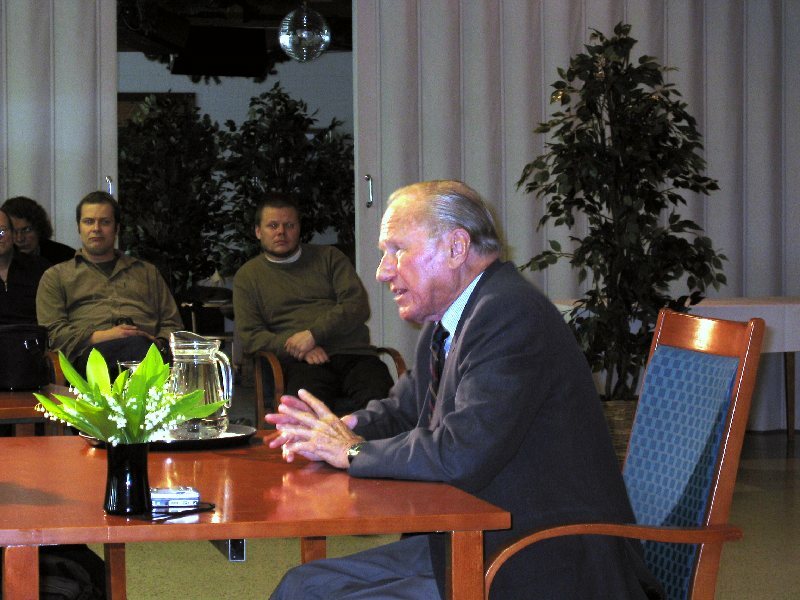 Mr. Rall was also well featured in the Finnish newspapers and television, which highlights the fact that Mr. Rall's visit definitely interested a lot of people. 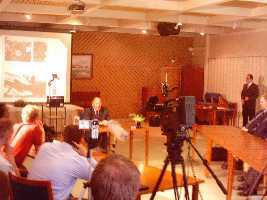 At the first lecture, at Tikkakoski, was around a hundred listeners. About one fourth or one third were actually flight simulator hobbyists, which gives a very good point about how home computer flight simulators can make even young people interested in history. The lecture by Günther Rall was arranged by the Aviation Museum Society, Finland and was open to all. That's why it was pretty hard to get down to the gritty details as the time for questions was limited to about 15 minutes. 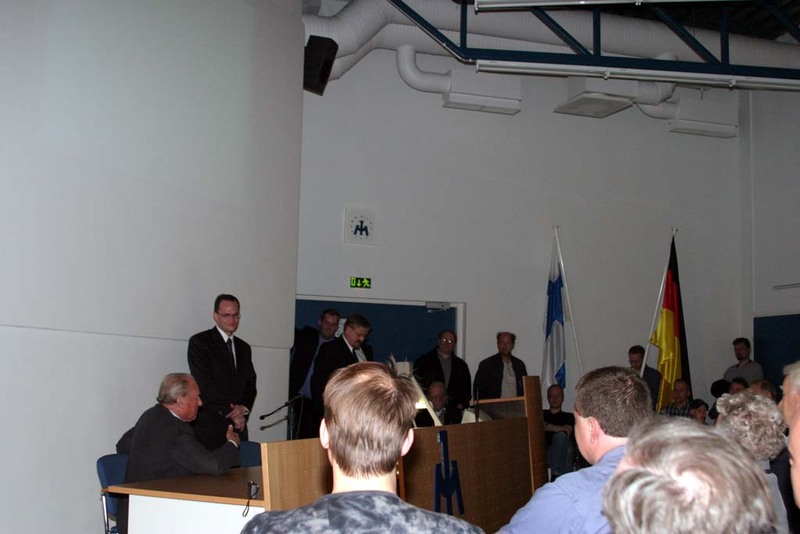 This first lecture took place at Tikkakoski Air Force Base's OC and continued with a tour at the Finnish Air Force Museum. 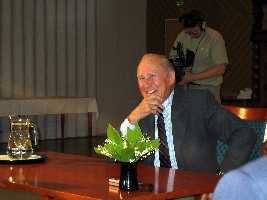 The son of a merchant, Günther Rall was born in Gaggenau on 10 March, 1918. 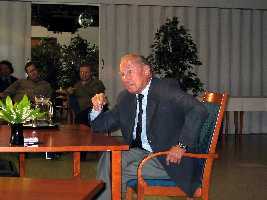 He entered military service as an Fähnrich in the Army in 1936. 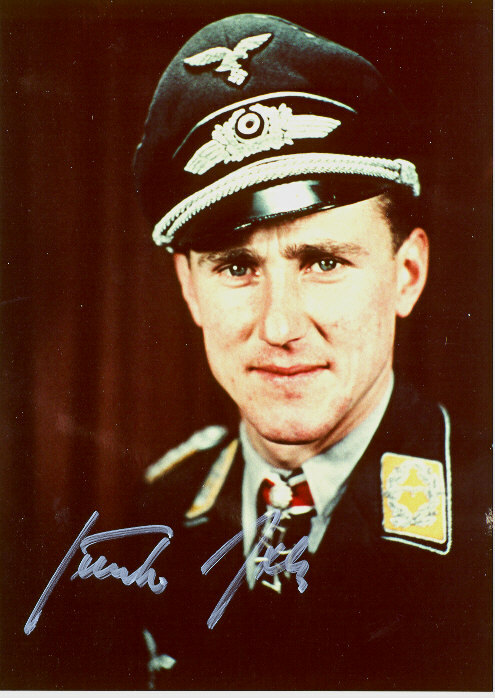 The following year, he entered the War Collage at Dresden where he was influenced to transfer to the Luftwaffe. He qualified as a fighter pilot in 1938, and was sent to JG 52 which at the time was based near Stuttgart. He saw his first combat during the Battle of France, and it was during this particular campaign that he began his personal victory score when on 18 May he shot down a Curtiss Hawk 75A from GC II/5, piloted by Czech pilot Sgt.Chef Otto Hanzlicek (which saved his live with chute). Shortly afterward, his unit was transfered to Calais to take part in the Battle of Britain. Shortly after beginning operations, he was given command of 8./JG 52 on 25th July and on 1st August he was promoted to Oberleutnant. By October, though, the Staffel had been withdrawn from combat operations in order to rebuild the losses suffered. After being brought back up to strength, the unit was sent to Rumania to defend the oil refinaries and bridges over the Danube during the German occupation of that country in the spring of 1941. In late May 8./JG 52 took part in Operation Merkur, the airborne assault on Crete, providing support for the German parachute and mountain troops. By this time Germany and the Soviet Union were at war and so once the Creten operation was over 8./JG 52 was hurried back to Rumania, where Russian bombers were attacking the refinaries. In five days Rall and his men destroyed some 50 Soviet bombers and were next sent to the southern sector of the Eastern Front. Here, however, Rall suffered a severe setback - after destroying his 36th enemy aircraft he himself was shot down by an I-16 and in the resulting belly-landing in a gully he broke his back in three places. He was paralyzed for a long time on the right side and the right leg. It was not until August 1942 that he was back in action, but in the first three months after returning to oparational duty he raised his score to over 100 victories, being awarded by Hitler on November 26th the Oak Leaves. In April of 1943 he was promoted to Hauptmann and given command of III./JG 52 on 6th July. 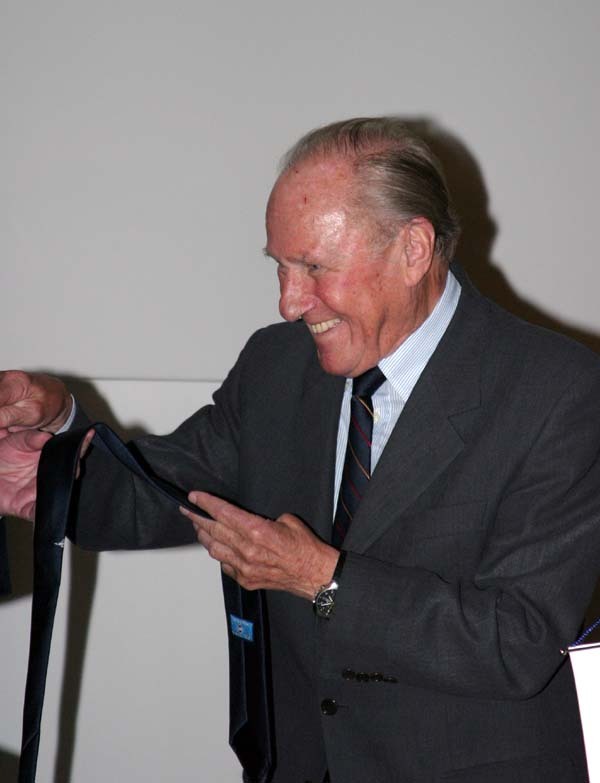 He scored his 200th victory on 29th August 1943 during his 555th mission, and on 12th September 1943, the Führer awarded him the Swords to his Knight's Cross. In October 1943 alone, he downed over 40 Soviet planes. Knight's Cross holders of JG 52 during a mission break in late 1942 in front of Rall`s Bf 109 G-2 "Black 13". 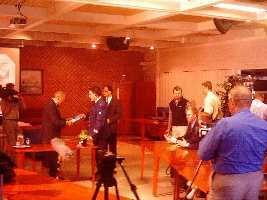 From left: Uffz. 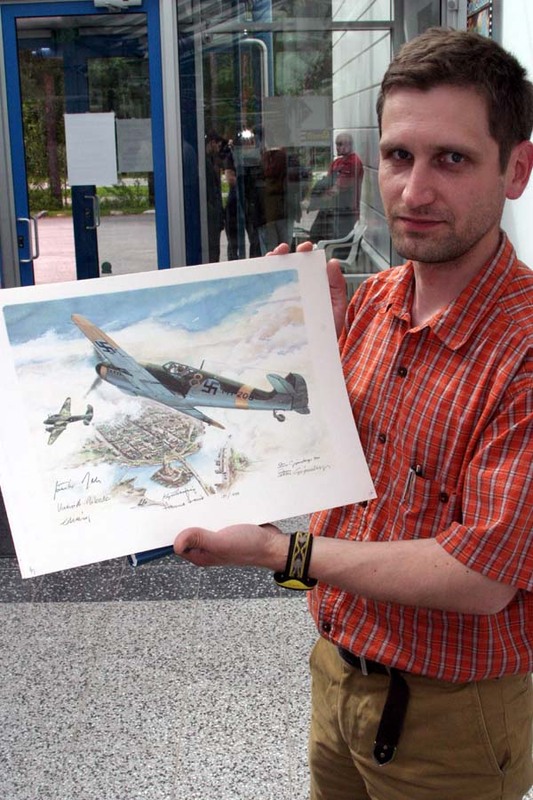 Karl Gratz (138 victories, RK), Oblt. 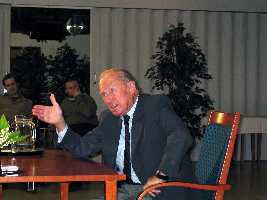 Günther Rall and Uffz. Friedrich Wachowiak (about 120 v. RK). In the spring (19th April) of 1944 Rall took over command as the Gruppenkommadeur of II./JG 11 which was at the time on Home Defense (Reichsverteidigung) duties against the 8th Air Force. On 12th May while flying Bf 109 G-5 "Schwarz ((+", W.Nr.110 089, of Stab II./JG 11, he nearly succeeded in downing the commander of the famed 56th FG, Lt Col Hubert Zemke (17 3/4 v., POW 30/10/44), and did succeed in destroying two Thunderbolts of this unit. However, he himself was attacked by another pair of P-47s from this same unit and was shot down and forced to bail out over Frankfurt / Main, in the process having his left thumb shot off. In the operating room he suffered a severe infection that kept him hospitalized until November. His last command was JG 300 oparting out of Salzburg from 20th February 1945 until the end of the war. There he was taken prisoner by the Americans at the end of the war. He flew a total of 621 missions, and was shot down no less than 8 times, being wounded 3 times during which he shot down a total of 275 enemy aircraft, including 3 on the Western Front to become the third highest scoring fighter pilot in history. "We must ask, what we can give to our Fatherland", said mr. Rall. And what it was like in the 50s? 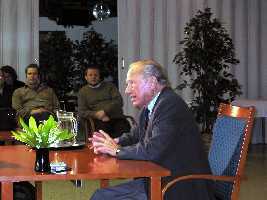 "The spirit was, Germany was integrated in the western alliance. We wanted to contribute to NATO. We were beginners in that. We felt it was important and wanted to work. NATO was - IS - excellent on that." "Try to keep peace. 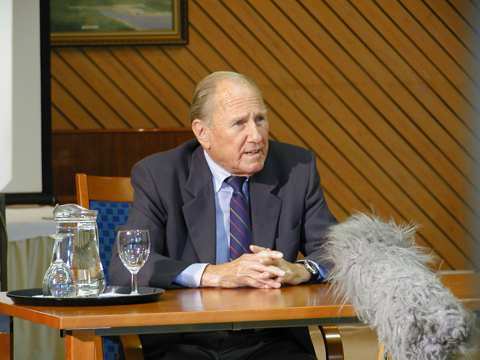 It is difficult but it is the only solution", mr. Rall stressed in interview. When you think of your experiences, do you have any dreams in the nights? "Not anymore but certainly the war was there for a long time, all the pressure. In the mind. Still, I always say that you can never get rid of this war, because it was most important time of our lives. Age of 21 to 27 - you are in combat or in hospital. This had its results." You joined Army in 1936, Luftwaffe in 38. This was a career choise to be in the army. "Ja, I was in the army, it was the army of soldiers. Then Hitler came. I wanted to go into air force, because I wanted to fly. And when I was in the Air Force, then I wanted to get fighter pilot. I think this is my temperament to be a fighter pilot. And it was by choise." How do you think young boys got back civilian life after the war, because many had gotten into the army in middle of their studies? "It was difficult, you know. But let me tell you, there was great spirit. Germany lost the war, 80 % of the cities were flat, ja? We were not so much orientated to money, money, money, like today. It was great spirit, build it up, and come back to life. It was great spirit. Even housewives built up houses - it was tremendous get-together. But now you know, different." "Today's world is what do I get. Those days they asked what can I give. Different life." 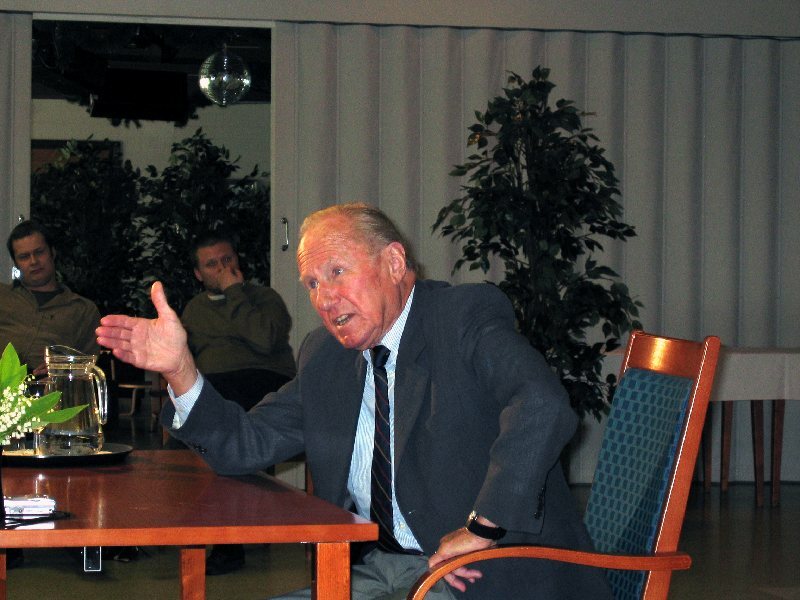 A career soldier, mr. Rall is completely against the war and gave interesting insights into NATO and the feelings between different countries and people in today's world. And he still remembered the good times in the 1950s, when he joined back into the new German Air Force and went to America for training. After their arrival a local newspaper photographed three of the top German aces in front of a P-51 and published the photo with caption "Göring's finest fly again". "They didn't take very seriously. Hey come on', now we are here? We talked about war without sentimentals. Just facts, how did you do this. But that is not a theme anymore, you know. We now fly jets and it is different." What the relations were back then like? "Friendly! Nothing else. Let me tell you, I made great friends there over the years and I go every year three times there. All the aviators, test pilots, civilians, great friends. Let me tell you, the problem we have right now, between US, Germany and France, this will go away, we know we have to work together. But this does not have any impact on personal friendships." European Union, the proposed common army and growing of USA to east? "Let me tell you, I don't know the detail problems. I think it is important that NATO is still federation, bridge, between United States and Europe. Spending to the east is also important, but it takes a long time. That is parallel relationship and it is important, there is no doubt. 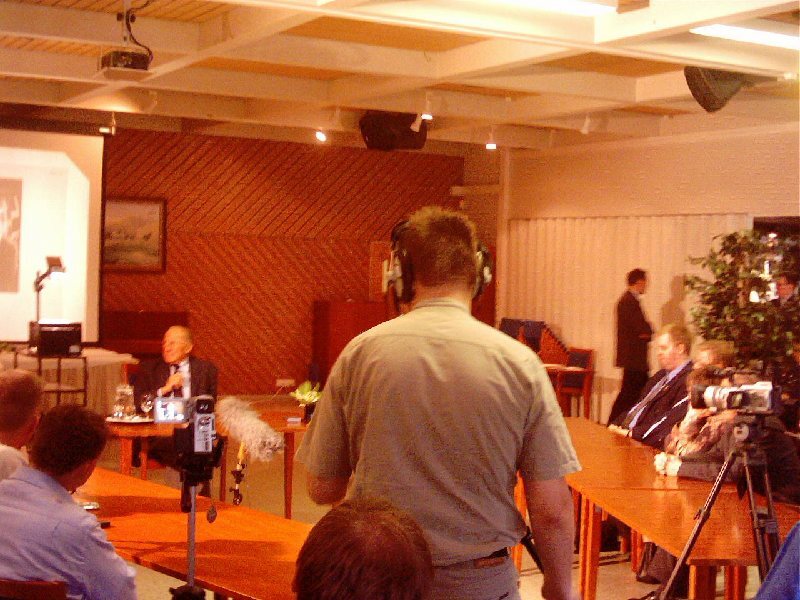 But we should always remember, that NATO is an important thing and it is binding between US and Europe." 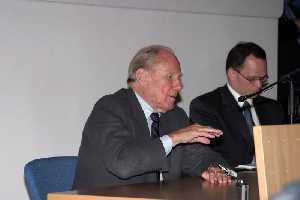 Rall told that he was for a short time in a unit that toured the Luftwaffe units, presenting the captured allied planes and educationg about their properties. He had some stick time with P-38, P-47 and P-51. Of those planes he told that he thought the P-51 was the best. I asked him what he thought of the matchup between late model 109's against those allied types he had flown. He answered that the worst shortcoming in 109 was the limited range, but P-38 and P-47 did not pose that much of a problem. But the P-51 was more difficult, very comparable to Bf 109 in actual combat. But as he said, P-51 could do it for a few hours longer in a flight. This Messerschmitt Bf l09 G-2 'black 13' was flown by Oberleutnant Günther Rall when he was Staffelkapitan of 8./JG 52 in September 1942. The G-2 was a non-pressurized fighter equipped with 2 7.92 mm machine guns mounted over the engine and a MG 151 20 mm cannon that fired through the prop hub. It used the same wheels as the 109 F series, 650 mm x 150 mm mains, and a 290 mm x 110 tail wheel. First of all he didn't like the slats in the 109, he more of wished to have a larger wing than these slats on the 109 His favorite Messerschmitt was the Bf109F-4. He said it could tangle with anything the enemy could put up and was the best of 109's, not too heavy etc. Later on he mentioned that the Russian pilots weren't some dumb target drones, but gave them a real challenge to tangle with. Especially the Guards Regiment's were tough and proud opponents. As interesting side not he said that in the Southern Front VVS had more than 1/3 of their planes of lend-lease types like Spitfire, P39 etc. Conditions were rough, they had to live in tents and moved from field to another pretty often. He didn't call the fields airfields but "lawns"..usually they were a place made suitable for flight operations and were hastily made to accomondate a few planes. He gave great respect to the work mechanics did to keep the planes airworthy. When asked about 109 vs. enemy planes he answered that the most dangerous plane in the west was P51D. He had flown the captured planes, including P38, P47 and P51. P51 was according to the ace fast, good guns and long range with pretty good maneuverability. 109 could still hold it's own against it. Of the P47 he mentioned that diving away from it was not preferable since the tremendous dive speed of P47 made it hard to get away from. It also had great structural strenght. About maneuverability he said the 109 had no problems staying with it in any move. 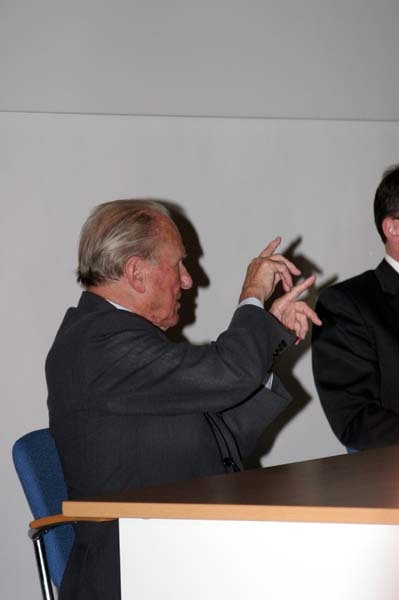 As a joke he mentioned the best tactic against P47 was "to shoot it down". He also mentioned that P47's used to circle German bases and shoot down the 109's returning with low fuel and no ammo..Rall said a lot of pilots went down because of that. Enemy had superior number of planes and didn't lack fuel, pilots and such like LW did. In Russian front Rall respected most the La5FN and La7. He said that especially the La7 was a very mighty opponent and both Lai-s could outspeed his G-6 with ease when he tried to chase them. About VVS he said that they learned very quick from the early war losses and later on came back in overwhelming numbers making the life of Jagdflieger pretty rough. Places Rall mentioned were Taman, Krymskaya, Kursk, Orel, Crimea, Sevastopol, Kerch etc. Rall's speech was very impressive and filled with a lot of info. He had very good memory and was in good shape. The session was taped and recorded by Finnish virtual pilots so I guess there will be something on the net later on..stay tuned! Herr Rall autographing books for Finnish Virtual Pilots Association "officials", Timo "Kossu" Niiranen and Jukka "Grendel" Kauppinen. 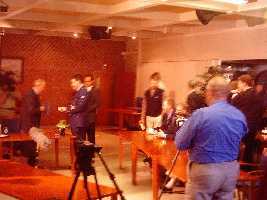 Mr. Rall arriving for photo shoot at the Finnish Air Force Museum. 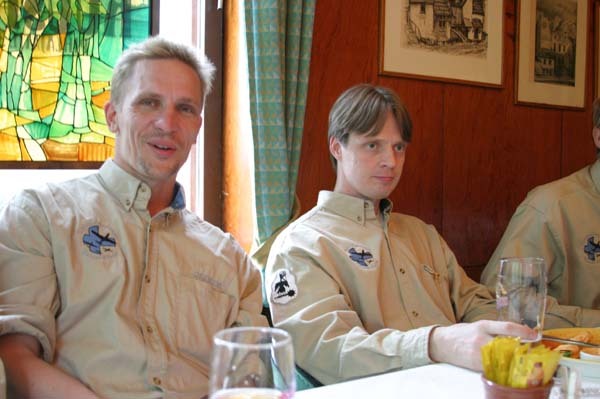 Left: unknown photographer, Museum chief Kai Mecklin, Janne Salonen from Aviation Museum Society and Günther Rall. A real gentleman he was, with a mind as sharp as a razor blade, one must remember he is of a age of 85 you know. There were about 100 (or at least some say) people around, of which some 20 virtualdweebs :) Once in a life time situation I should say, glad I was able to be there. He spoke very good English and had so much to tell. Only regret is that (the Sunday) presentation lasted for only an hour and some The place was packed, people were standing on the sides after all the seats had been taken. And when he walked into the room the whole crowd stood up and applauded. Someone asked that what was the furthest distance he had shot down an enemy and he just said that what they taught to the new pilots was to shoot when the enemy plane was large enough to fill the REVI sight reflector glass from side to side. He thought that shots from 500m or so were from too far away. His answer to the question that what was the most important thing a fighter pilot must possess is discipline of his actions in the air and knowing the limits of his plane. I think the funniest question/answer was "How did you relieve battle stress when you were fighting at the eastern front?" - he replied "You know, there is not much to do when you live in a tent in Russian plains" (laughter). Later he told they had to move their AF 44 times during the period in southern Russia. Logistics problems were really bad. There were a lot of interesting things he mentioned. Did you know how Rall's wingmen always knew which plane he was in after his back injuries? He had to use inflatable cushions around his back to make it possible to continue flying and pulling Gs, so he was the one always looking to be bent way forward towards the REVI sight in his Messerschmitt. 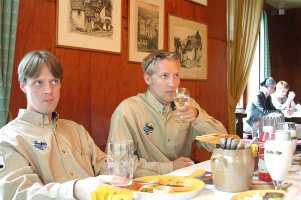 A funny anecdote after the war when Rall and Rudel were taken from captivity in France to UK for RAF "interrogations". 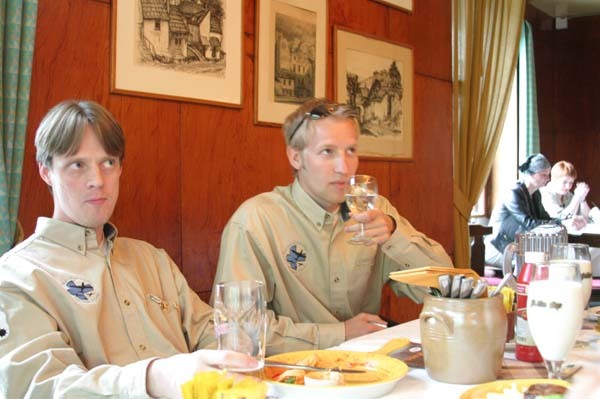 Two of the famous German aces. 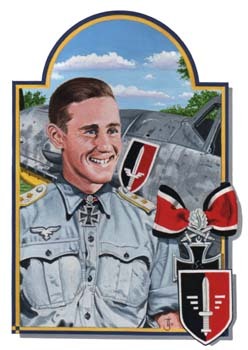 Rudel, the most decorated German soldier ever, and Rall the 3rd highest scoring fighter ace. Of course there was a reception commitee to meet them. What did they see? Rudel, on crutches, carrying his artificial leg on his back across his rucksack, and Rall, missing a thumb, walking stiffly down the stairs because of his wounded back. But the best things in life are elsewhere. "When I married my wife." 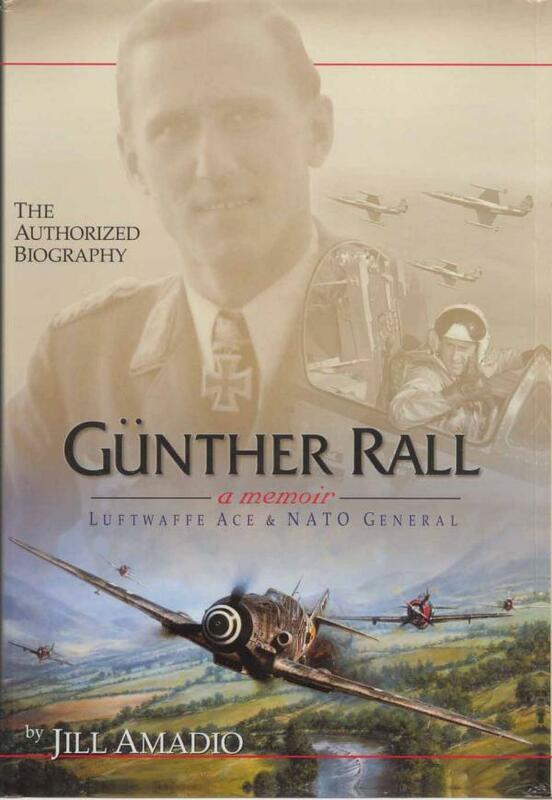 Günther Rall, fighter ace and NATO general, waited fifty years before authorizing this first biography that chronicles almost a century of his life and coincides with some of the most dramatic moments in the history of the twentieth century. 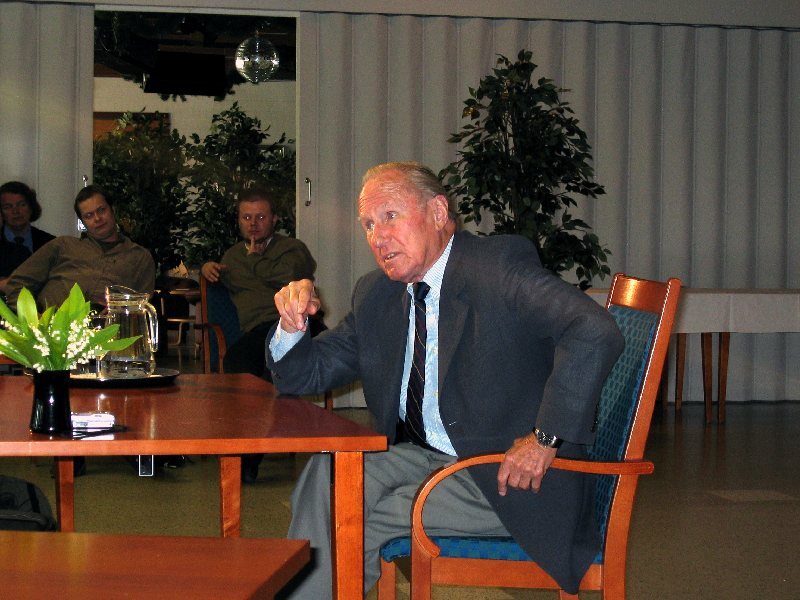 His story spans a childhood in a defeated country, two world wars, the calamity of the Nazi regime, the Cold War, the jet age, his distinguished service as a NATO military representative, his work with the US Air Force, and chief of the new German Air Force. In civilian life Rall has been one of the most sought-after military consultants and advisors by international agencies, ministries of defense, and multinational corporations. This third ranking ace of all time, who fought on the Eastern Front during World War II, vividly describes aerial dogfights and his 275 victories, being shot down eight times, having his back broken in three places, and the loss of his left thumb. He relates the struggle to survive in the brutal Russian winters, and reveals his days as a POW. Rall was 21 when Europe went to war. He was 22 when he was promoted to squadron leader, and a 27-year old wing commander when he was captured by the Allies. 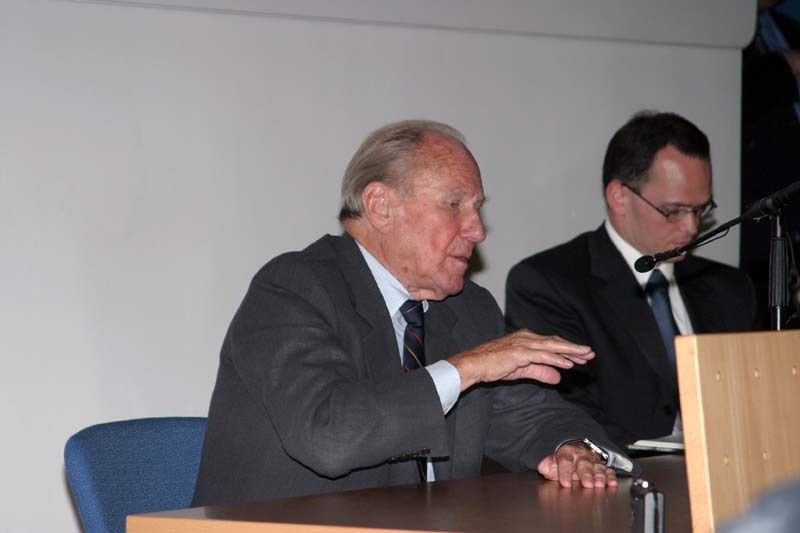 In the post-war period he sought out ways to serve the new, democratic Germany, determined to help regain other nations' respect for his country after Hitler's horrendous betrayal of its people. 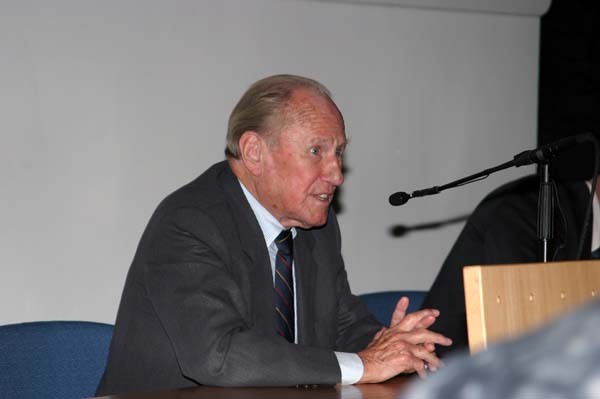 General Rall's leadership skills and personal integrity earned him great esteem and the Americans were quick to bring him to the United States for assistance in the development of the F-104 for the NATO countries, making him the first German pilot to test Lockheed's Starfighter. The biography includes Rall's perspective of global affairs that a lifetime of public service has shaped and other reflections. In the words of Colonel Don Lopez, deputy director of the Air and Space Museum: "We have all been waiting a long time for this important book." Led by Colonel Hub Zemke, the 56th Fighter Group played advance guard to a deep penetration bomber raid to central Germany. As his forty eight P-47 Thunderbolts arrived to sweep the sky around the Koblenz -Frankfurt area, the Me109s of II./JG11 pounced from a 5000 feet height advantage. 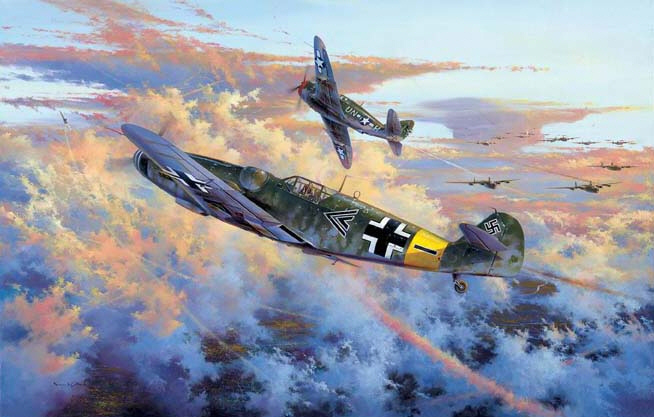 Simon Atack’s high-impact painting shows Major Günther Rall bringing down Hub Zemke’s wingman, the first of two victories he claimed before himself being brought down by 56th Fighter Group P-47s later in the combat. 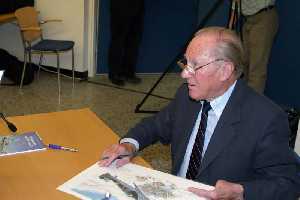 Günther Rall returned to combat flying, commanding JG300 until the end of hostilities by which time, with 275 air victories, he became the third highest scoring Ace in history. The Finnish Virtual Pilots Association wants to thank the Aviation Museum Society, Finland very warmly for arranging this unique, wonderful chance to meet one of the greatest pilots in the aviation history. 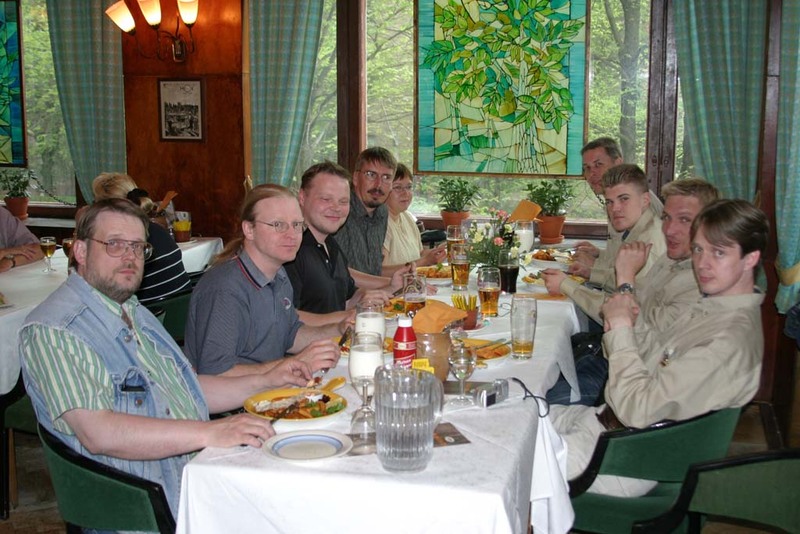 This meeting will be remembered fondly by all who had the chance to meet him! Virtual pilots on the debrief after the lecture on Sunday.